When KSL Capital Partners’ proposed development for Squaw Valley threatens everything that makes the North Lake Tahoe/Truckee Region special, it is people like you who continue to stand with Sierra Watch in advocating for a future we can all be proud of. 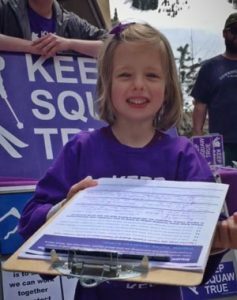 Over 8,000 concerned individuals have joined Sierra Watch by signing the petition to Keep Squaw True. These are locals, second-homeowners, and visitors to the Tahoe region. Over 300 private citizens wrote letters to Placer County during the public comment period on the Environmental Impact Report for KSL’s Village at Squaw Valley Specific Plan. They joined a host of regulatory agencies, neighboring jurisdictions, and conservation organizations in taking Placer County to task over the environmental review of the project. 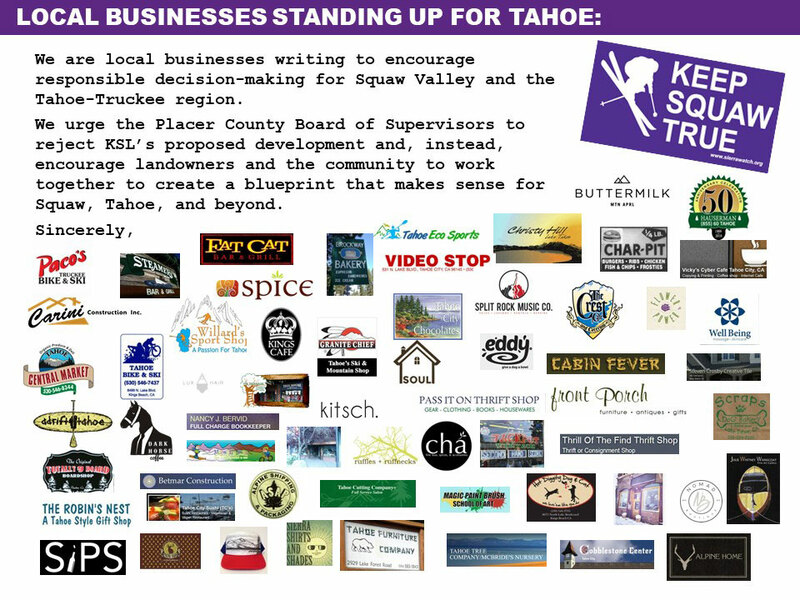 68 local businesses in Tahoe City, Kings Beach, and Truckee signed a joint letter that recognized KSL Capital Partners’ development as a threat to not only their quality of life but, also, their economic viability. Over 200 citizen volunteers have turned out for every public hearing held by Placer County and made passionate and reasoned arguments against approval of KSL’s proposed development, helping create a legal record of public opposition. Many supporters have donated to Sierra Watch, creating the means to retain the best experts in the fields of planning, environmental analysis, and law in standing up for the communities of Lake Tahoe and Truckee. 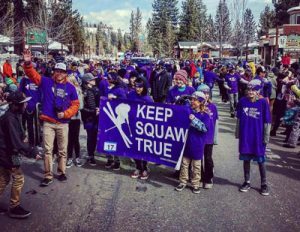 Lastly, awareness of the movement to Keep Squaw True spreads further, whether that’s via social media, folks sporting a sticker on their skis, snowboard or the back of their car, or rocking our t-shirts and other items to start up meaningful conversations with others.